Home » SUNRAISE summer school "Monitoring and early warnings in mountain social-ecological systems"
The consortium of SUNRAISE partners has completed its first summer school Monitoring and early warnings in mountain social-ecological systems. The school was co-hosted by Siberian Federal University (Krasnoyarsk) and Gorno-Altaisk State University from July 15 to 29, 2018 in cooperation with a sister Erasmus+ Jean Monnet project SMART run by Siberian Federal University. The Summer School faculty roster included thirteen members representing all the SUNRAISE partners from the EU as well as from Russia, and also external faculty members affiliated with the SMART project. The students came from five countries, such as Russia, India, Austria, Estonia and Portugal. The objective of the summer school was to build research capacity and strengthen science-policy interactions for addressing these issues in Altai Mountains and beyond. The focus was on monitoring, reporting and verification systems for governance of mountain social-ecological systems, recognition of early warnings and development of science-policy interfaces. This discussion was primarily based on the EU experience. It was analysed for its applicability in Russian (in particular Siberian) socio-economic, political and biophysical context. Preparatory School was open from July 15 to 18, 2018 in Krasnoyarsk at Siberian Federal University for Russian-speaking participants only, who needed to adjust to the intensive pace of an international activity training, and to familiarise themselves with the terminology used in the international literature. 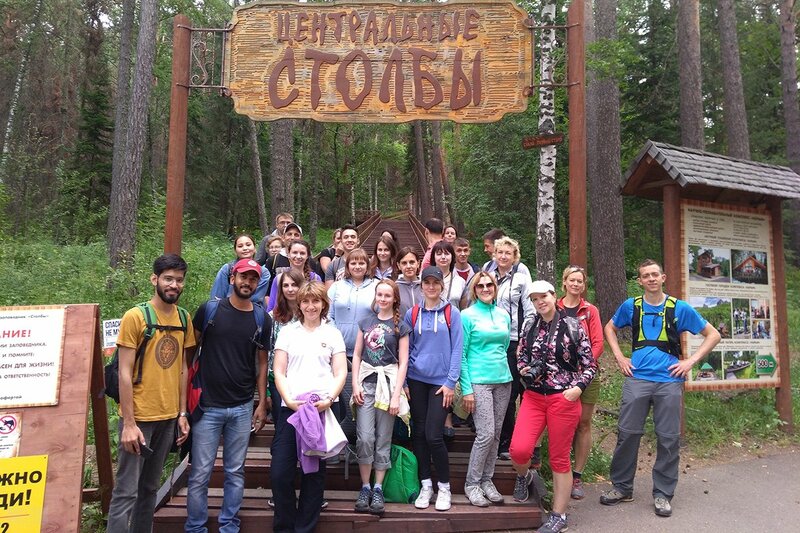 The program included introductory sessions by resident and guest faculty of Siberian Federal University and a short field research training in “Stolby” Nature Reserve, a large nature protected area featuring unique biodiversity and geological formations, just on the outskirts of the city. The focus of the field training was on biodiversity management and governance of a mountainous area under the high recreational and urbanisation pressure. In-School period (or the School proper) was open from July 19 to 28, 2018 in Gorno-Altaisk State University and at the premises of its partners in Altai Mountains, when the main program of the School took place. During the in-school period we offered a number of highly interactive sessions designed to familiarise the audience with the state of art in the field and analytical tools; this was followed by supervised group research, and then by presentations of research findings to the school faculty and stakeholders. The topics for group research were identified by students with a help of the School faculty and stakeholder representatives. To facilitate the process, we prepared comprehensive descriptions of the case studies, each characterised by several interrelated environmental or socio-economic conflicts. The task of student groups was to identify the particular problem they wanted or were capable to analyse and address given time and resource constraints, to develop research proposals containing the research question, its justification and research methodology, and to perform the research. The case studies were set at three locations in Altai Mountains characterised by a broad range of sustainability issues and disturbing trends. The first one was the Lake of Teletskoye, the second was Katunski Biosphere Reserve, and the third one was by the Lake of Manzherok. The detail school program with case study descriptions can be found here. The design of the school worked really well! The school was rich in learning outcomes, and our students not only produced good research reports, but also had a lot of fun!